A ruminant is any hooved animal, such as a cow, that converts unusable plant material into food and fiber through a two step digestive process. A grass-fed cow is a healthy cow because it's consuming its natural diet of grass, avoiding the need for antibiotics to keep it healthy. A grass-fed cow is naturally healthy and strong. There are many reasons why people choose to eat grass-fed beef. Topping the list are nutritional differences, protecting the environment and humane treatment of animals. These are all important reasons for making the switch over to grass-fed beef. Still in doubt? Considering the natural diet of any ruminant is grass, wouldn't you want to consume your meat the way nature intended? Cows that are fed grain become sick because the grain causes an unnaturally acidic environment in their stomach. An acidic cow increases the risk for E. Coli proliferation according to researchers at Cornell University. This risk is passed on to anyone who consumes this meat. That's just one of the risks of eating grain-fed beef. What exactly is grass-fed beef? Grass fed beef comes from cattle that is raised in open pastures fed a diet of 100% organic grass – their natural diet. The consumer should look for grass-fed beef that is raised on grass from birth to market place. Be wary of beef labeled 'grass finished' or 'mostly grass fed'. These cows are usually fed grain for the majority of their life and are only grass-fed in their final stage of life. Feeding the animal grains depletes the nutritional value (particularly omega-3 stores) almost immediately. Even better, if you can find it, is organic grass-fed beef. This meat comes from animals that are not given antibiotics, drugs, growth hormones or genetically modified food. They also must have free access to the outdoors and the meat may never be irradiated. Before a food can be labeled organic, a government approved certifier inspects the farm where the food is grown to ensure that the farmer is following the necessary rules to meet the USDA organic standards. All handling and processing must be certified too. According to US government statistics, there are no known cases of organic meat causing a food poisoning epidemic, such as E.Coli poisonings. Although Organic beef has its merits, truly the best beef is grass-fed and organic. Considering the natural diet of any ruminant is grass, wouldn't you want to consume your meat the way nature intended? If you are unable to find organic grass-fed beef, it is still a better choice to get grass-fed beef since a lot of grass farmers are using organic standards but just have not been certified yet or they don't follow all standards. Even if they aren't using organic standards, the nutritional superiority of grass-fed beef is reason enough. The nutritional profile of grass-fed beef is far different from that of grain-fed beef. Some of the nutritional differences in eating grass-fed beef compared to conventional beef are: higher amounts of omega-3 fats, higher in CLA (Conjugated Linoleic Acid) which has been shown to improve weight loss, more beta carotene, 400% more of vitamins A and E and practically no risk of Mad Cow Disease since grass-fed cows are fed a vegetarian diet. So what does all of this mean to the consumer? Let's take a closer look at the nutritional power-houses found in grass-fed beef. You will find two to three times more omega-3 fats in grass-fed beef. Omega-3 has been in the news quite frequently lately touting decreased risks for Alzheimer's, Attention deficit disorder, depression, cardiovascular disease, and cancer. It helps regulate important cardiovascular functions like heart rate, blood vessel dilation, blood pressure and blood clotting. Omega-6 fatty acids promote inflammation and may compromise your body's immune system when not taken in the right proportion to Omega-3. The ideal omega-3 to omega-6 ratio is 1:1, but according to a recent study by researchers from Perdue University and Colorado State University, grain-fed beef has a ratio that ranges from 1:5 to 1:13. Grass-fed beef's omega-3 to omega-6 ratio is 1:2. Grass-fed beef also contains three to five times more CLA, which is another good-for-you fat. CLA is found in the fat of ruminant animals fed a grass diet. Recent studies have shown CLA to decrease the risk for cancer and diabetes, help reverse existing atherosclerosis, and decrease the progression of osteoporosis. CLA also has been shown to reduce body fat by aiding in the regulation of glucose and insulin levels. Meat and dairy products that are grass-fed are the richest source of CLA. Since most Americans are deficient in vitamin E, you'll be happy to know that grass-fed cattle is higher in Vitamin E. This potent anti-oxidant has been shown to lower risk of heart disease and cancer. Vitamin E has also been looked at for its anti-aging properties. Another little heard of fat, Butyric Acid, is also found more abundantly in grass-fed animals. Butyric acid has been found to slow the growth of cancer tumor cells and promote the growth of healthy cells. Once you switch over to grass-fed beef, you can reduce your risk of a number of the more prevalent diseases today – obesity, diabetes, cancer and cardiovascular disease. Grass-fed beef is naturally lower in fat and calories. The meat has as much as 6 times less fat than grain-fed cattle, which also makes it lower in calories. Aside from nutritional benefits, there are significant benefits to the environment. There is less environmental pollution with grass-fed beef through the use of land rotation. The manure naturally fertilizes the land and rotating the pastures naturally aerates the land. In comparison, conventional farming methods substantially contribute to water pollution from untreated animal waste run-off, not to mention fertilizer and pesticide contamination. If you are new to grass-fed beef, there is a specific cooking method that you should use to ensure the best texture. You'll want to cook it slower at a much lower heat than you would cook conventional beef. Since there is less fat content, a higher heat tends to quickly burn up the fat and dry the meat out. The best method is to sear the meat first, then cook it off at a low heat until it's medium done. The smell, flavor, texture and look of grass fed beef differs slightly from grain-fed beef. Most people enjoy it immediately because it's how beef should taste while others may need time to adjust to the differences. While you may find the beef similar to the taste of buffalo, the taste can vary depending on the variety of the cow's diet. The best farmers will vary the diet of the cow seasonally causing the perfect amount of marbling and flavor profile. Now that you are convinced, where can you find your grass-fed beef? Unfortunately, about 85% of the beef in the US is grain-fed so it is sometimes difficult to find grass-fed beef locally. You can find some reliable sources online that will ship the meat to you. You can also find grass-fed beef locally at your health food store or natural food market. Ideally you can find a local rancher who raises grass-fed cattle for purchase. 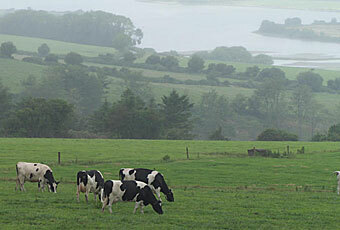 Check your area for local grass farmers at www.eatwild.com – a great resource for information on pasture fed animals. Or check our list of organic and natural grass-fed beef suppliers. plus you are eating meat the way it was intended to be eaten with the nutritional value intact! © 2006 GreenPromise.com All rights reserved. Help save the planet by spreading the news about natural and organic products and how to live an organic and green lifestyle. For reprint permission, contact the Green Promise editorial staff at reprints@greenpromise.com.